There are a few important things they don’t tell you about Edmonton. 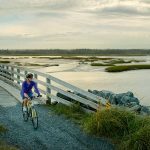 My father grew up just outside the city, but I knew very little about Canada’s northernmost urban centre. So, in order to figure out what to do in Edmonton, I’d done a little research, which included reading The Yards, an Edmonton urban issues magazine. 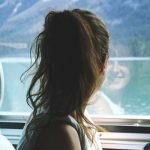 I knew about the hipsterization of Whyte Avenue, the ICE district being built around the new stadium, that the architecturally impressive Royal Alberta Museum was about to open, and that the city went from having no bike lanes to having one of the most comprehensive networks in the country in under a year. But somehow I’d missed the fact that the place has been split down the middle by an enormous, majestic gorge, carved out of the Prairie by the noble and languorous North Saskatchewan River. 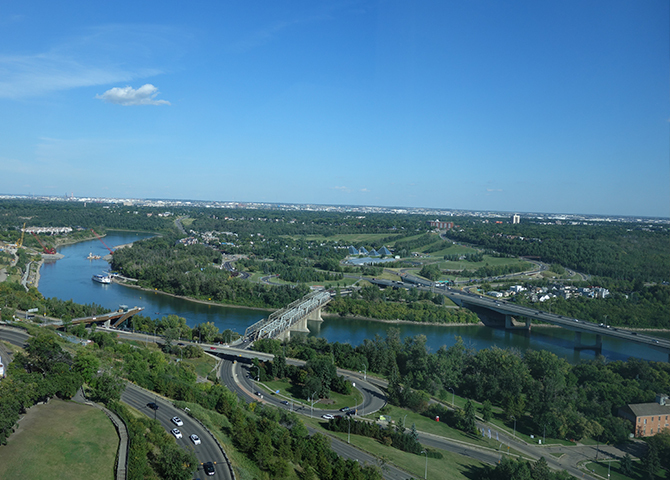 This topographic novelty gives Edmonton something flatland cities rarely have: views. 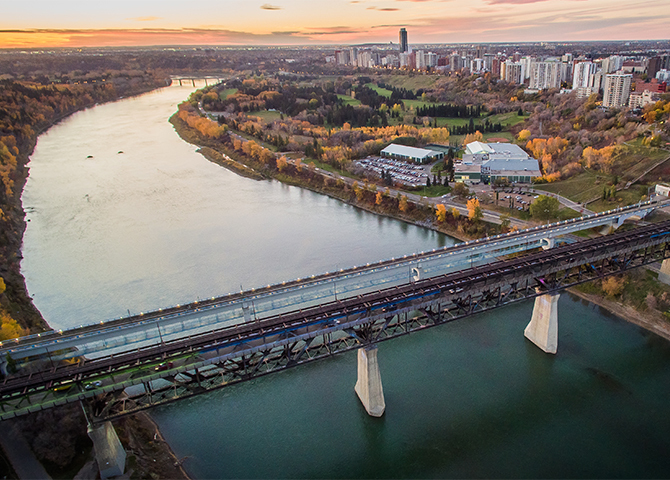 Though there are great ones from the High-Level Bridge, the Low-Level Bridge, and any number of parks and spaces that thread the brow on either side, there are two, in particular, that you shouldn’t miss. The first is the one from a place Edmontonians call The End of the World. You could walk there, but I’d recommend riding on some of those new bike lanes. There’s a good bike rental place, River Valley Adventure Co., in the gorge directly below the Chateau Lacombe hotel, which is where you’re going to find the second view (see below). You get to that first one by taking a short path off Saskatchewan Drive in the neighbourhood of Belgravia (Google gives the closest address as 7433). I went there with Omar Mouallem, former editor of The Yards, who gave me a bit of backstory, including the fact that it’s the site of the collapsed Keillor Road, the abrupt and jagged end of which gives the site its name. 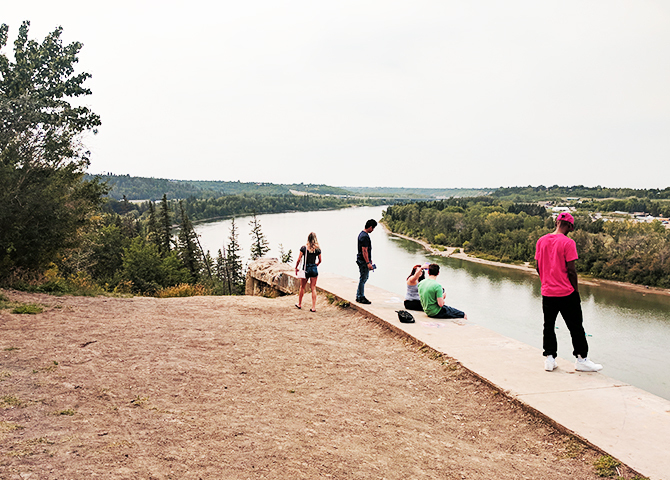 Perched on the remains of a retaining wall, the south end of the city and the University of Alberta campus hidden behind you, you can sit and gaze at the broad river stretching out as far as you can see in either direction. From here, with the exception of a few houses, all you see is the primordial Prairie and a river doing its best to turn a valley into a canyon. The gorge ends up defining your experience of the city as shuttle between the old city of Edmonton to the north and the old city of Strathcona to the south. In the south, you’ll find the Muttart Conservatory, four glass pyramids (seen in the top image) designed by Edmonton starchitect Peter Hemingway, each housing a different horticultural eco-system. Also in the south is Bonnie Doon, an unexpectedly francophone neighbourhood where you could ride your bike to La Bicyclette Café and hear nothing but French as you sip your glass of Côte du Rhône. Whyte Avenue, one of the city’s main drags, is also on the south side, but it’s the north side where you’ll want to spend most of your time. Start at the Art Gallery of Alberta, a sophisticatedly curated place with a great sense of fun – they had an entire exhibit devoted to Wayne Gretzky when I was there in the fall. The north side is also where the restaurants are. 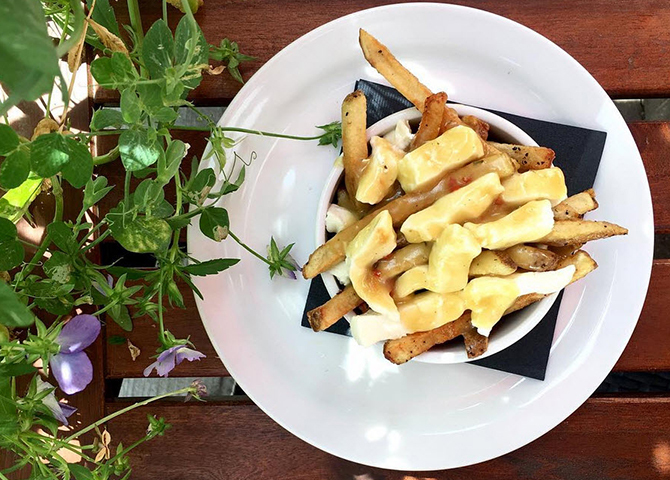 Despite being the birthplace of both Boston Pizza and Earl’s, Edmonton’s food scene is broad, eclectic, and admirably specific. The first restaurant that put the city on the foodie radar was Corso 32, an Italian place founded by chef Daniel Costa that has since spawned two sisters directly next door (Bar Bricco and Uccellino). Try the Radikon Slatnik, an orange wine from Friuli that pairs perfectly with their beef and pork agnolotti and fresh-pea crostini. 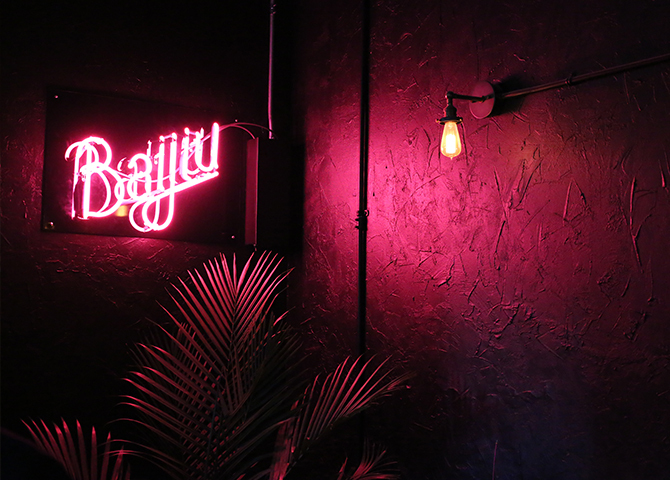 Baijiu is part of the new generation of restaurants – along with a well realized Mexican place called Rostizado — that’s built on Costa’s success. Its Alberta-Chinese fusion that produces thickly marinated pork bao and an inventive semifreddo-filled deep-fried bao version of an ice-cream sandwich by chef Alexei Baldireff. Diners are disappearing across the nation, but Edmonton’s keeping the flame lit with the truck stop-themed Route 99, and the truly old-school Commodore (est. 1943), complete with chocolate bars and gum for sale under glass at the cash. It’s a good town for cocktails, too, the best ones at the moment being at Clementine, where you should ask for a Doctor; a scotch, Rauchbier, and peat concoction that’s smoky and boozy in all the right places. But the most unforgettable culinary experience to be had in Edmonton comes as a package deal with that second great vista I mentioned, at the top of the Chateau Lacombe hotel. Founded in 1967, and so celebrating its 50th anniversary this year, the Chateau Lacombe is the proud owner of one of the country’s few surviving revolving restaurants, La Ronde. 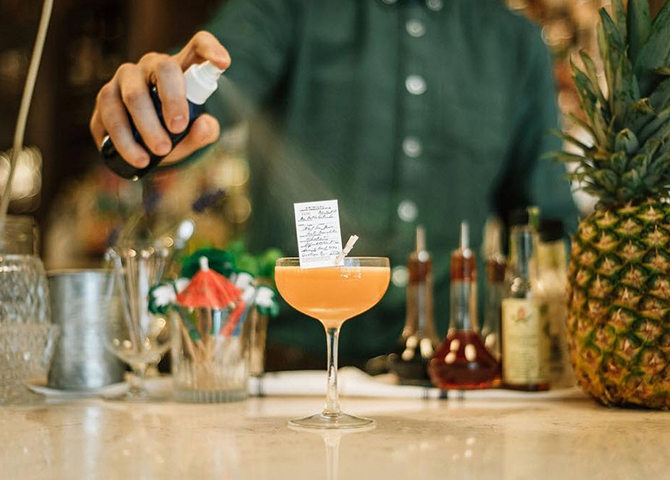 For its birthday year, it decided to double down on its 60s-cool vibe and excavate a few original recipes from the vault, which it offers on Retro Thursdays. Drawn from an age when everything was drenched in complicated sauces and often set on fire, these recipes — often prepared table-side— compete with the panorama of this surprising city over the course of each 88-minute revolution. 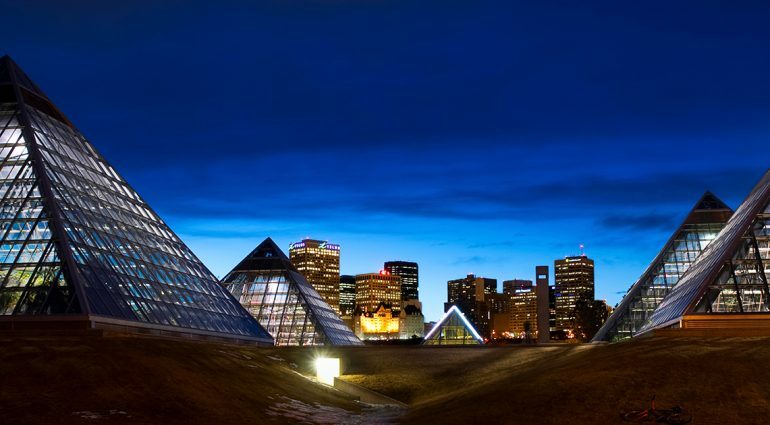 Click here for more suggestions on what to do in Edmonton!